Public access to a popular Bay Area beach is surging toward a showdown on several fronts. 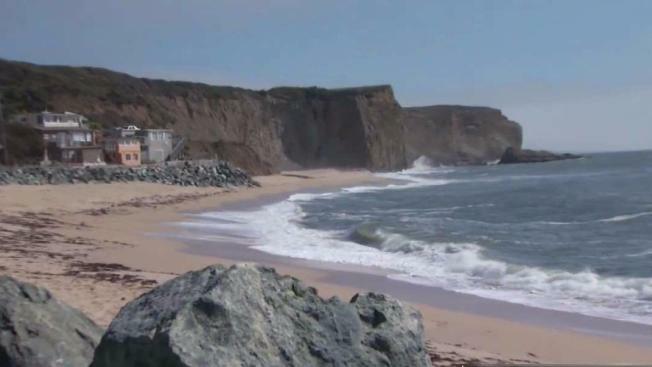 On Friday, a state Assembly committee could take a big step to force open a path to Martins Beach near Half Moon Bay. The committe will consider Senate Bill 42, which calls for a fund to buy and build a public path to Martins Beach as part of an eminent domain process. High-tech billionaire Vinod Khosla bought property there and put up a gate on the only road to the public beach. And despite a ruling by the appellate court earlier this month to open or remove the gate, it's still there and still closed. On Wednesday, beachgoers had no fear of going around the gate as a steady stream of visitors made their past the obstacle donning a "No trespassing" sign. "You can't shut off this Beach from the public, especially such a beautiful beach, surfer Kevin Cahua said. "I went down there, and there's a lot of animal life, a beautiful beach. I think a lot of people would like to come down there." Legendary surfer Dave Campbell agreed, and because he uses a walker, he said the gate literally stops him from joining the surf crowd. "I can't take them out on a board, but I can stand there and talk to them about the days I spent surfing and how much I love it," Campbell said. The Surfrider Foundation, which launched the legal fight against Khosla, said it is watching SB 42 closely. "We've got our fingers crossed," said Robert "Birdlegs" Caughlan, former Surfrider Foundation president. "It's always scary when you're in the Legislature, and the bill is in what they call 'suspense.' So we're in suspense too." The foundation says Khosla is seemingly defying the appellate court order. "You bet we're going to go after him to get that gate open," said Joe Cotchett, attorney for the Surfrider Foundation. "Or we're going to ask the sheriff to go after him." Khosla's attorney did not immediately respond to requests for comment, but many observers and analysts anticipate the billionaire will take the fight to the state Supreme Court.